When I was younger, I loved reading. I loved it so much that I would have rather stay inside and read than go outside and play with the neighborhood kids. I think that reading is a great way to not only expand ones vocabulary and grammar but also a great way to spend time with your little ones which is why I think you should check out Eebee’s Adventures books. Eebee’s Adventures are a series of books featuring a puppet character the size of a 1-year-old named Eebee. The books are designed to engage you and your baby with rich play experiences that provide powerful lessons that memorizing letters, numbers, colors and shapes simply cannot do. Watching and, importantly, “doing” eebee’s adventures will allow you and your baby to see and learn first-hand what happens when you explore a crinkly, crunchy, smooth and bumpy paper mountain or roll, bounce, bop, bang, slide and toss your way around a world of balls and ramps. We know that when your child is playing, she is actively trying to figure things out about objects and people—why did that ball roll and the block slide? How did he do that? Why did that happen?… The questions, theories and solutions just continue to evolve as your child develops and masters a myriad of critical physical, social and intellectual skills—playing and learning about how the world works and he works in it. Every parent can recount a time when their infant headed straight for that curtain to give it a pull; or happily opted to tear the wrapping paper rather then engage with the gift; or tried and tried to get the round peg into the square hole; or simply offered you whatever was in their hand. I received a copy of Here to There: An Up, Down, and All-Around Adventure and All About Me and You: Head-to-toe Adventures for your baby. 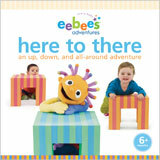 Here to There: An Up, Down and All-Around Adventure is the ideal book for the intrepid and adventurous toddler. The book features up, down and all around adventure activities for active toddlers who are discovering stairs, slides and anywhere and everywhere hide and seek games. Here to There provides parents with exciting and entertaining ideas to help develop motor skills and independence and features adorable babies and eebee. Here to There is for ages 6 months and up. All About Me and You: Head-to-toe Adventures is about eebee’s body and your baby’s body, too. Each page is an interactive board game, designed especially for babies. Fold-out the book-sized mirror to ‘look and play’ along with eebee. Start anywhere. . . go anywhere! Look in the mirror! Invent your own playful games! Exercise your baby’s social, motor, language, and thinking skills, and explore baby’s body from head to toe! via blissful-reviews.com » Eebee’s Adventures Review.